Born on November 24, 1713 in the village of Petra on the island of Majorca off the coast of Spain, young Junipero entered the Order of Friars Minor (Franciscans) to study for the priesthood at the Colegio de San Francisco. After earning the doctorate in Sacred Theology at the National University of Blessed Ramon Lull, Serra was appointed to the chair of Scotistic Theology. The prestige he enjoyed in academic circles and the popular acclaim accorded him as a preacher augured an illustrious ecclesiastical career. Upon disembarking at Vera Cruz, Serra set out on foot (275 miles) in pilgrimage to the shrine of Our Lady of Guadalupe in Mexico City. For next 35 years, until his death in 1784, Serra labored tirelessly in Mexico and what is now the State of California. Scholars of the period recognized St. Junípero Serra as a zealous missionary and a prudent administrator who courageously answered the call to bring the Gospel of salvation to the Native people of Mexico and California. After many decades of compiling research and personal testimonies in support of sainthood for Serra, friars of the Province of St. Barbara were called upon to present their case to Pope Francis who proposed to canonize Serra for his heroic virtue and his dedication to evangelization. On September 23, 2015, with Pope Francis I presiding at a special Mass in Washington DC, Junipero Serra became the first saint to be canonized on U.S. soil. 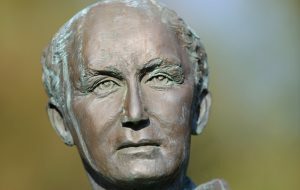 For more information on St. Junipero Serra and the issues connected to his canonization, please click here.